Francesco’s debut in Asia with the Piano Solo China Tour 2013. 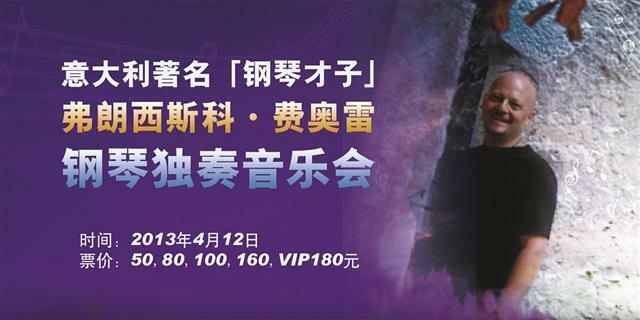 The opening concert has been held April 12, 2013 at Ningbo Grand Theatre, the tour will then proceed in Zhuji, Shanghai, Jinan, Huzhou, Hangzhou. Several Asian premieres have been performed, by authors such as American composer William Susman, Dutch composer Douwe Eisenga, British composer Neil Campbell, Italian composer Matteo Sommacal and Francesco’s music, all with original visuals by Valeria Di Matteo.